Just as an update to our previous post here, Jeff Kenney wrote a piece regarding Kris Bex’s presentation to the Culver Kiwanis Club in the June 14th edition of the Culver Citizen. (You can click on the article to the below to enlarge it.) Thanks for the plug Jeff! I would imagine Jeff found a kindred soul in Kris Bex, knowing Jeff’s interests in writing and history. 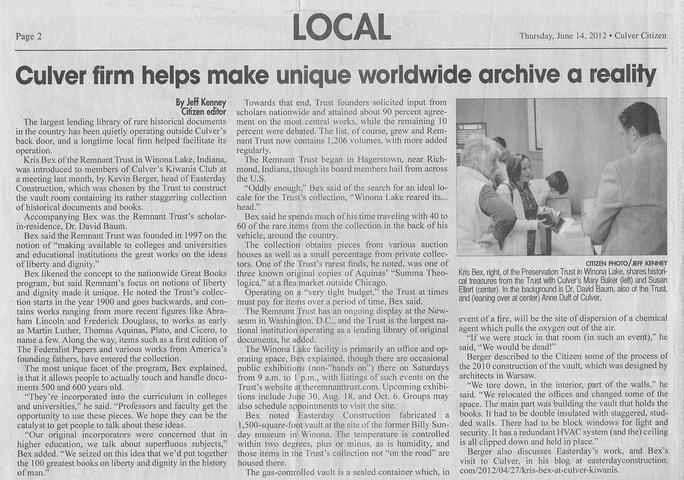 The Remnant Trust’s focused mission to preserve documents promoting Liberty and Dignity makes it a unique asset to Northern Indiana. I will be attending a Remnant Trust event this evening. There will be a tour of the facility, some period character actors and a social gathering for local supporters. I’m looking forward to the event (even though I’m forced to wear a tie!). It is always interesting to go back to completed projects and see how they evolve from the original plans. The Remnant Trust is a particularly interesting example since the facility serves as somewhat of a museum and is constantly changing their displays and presentations.